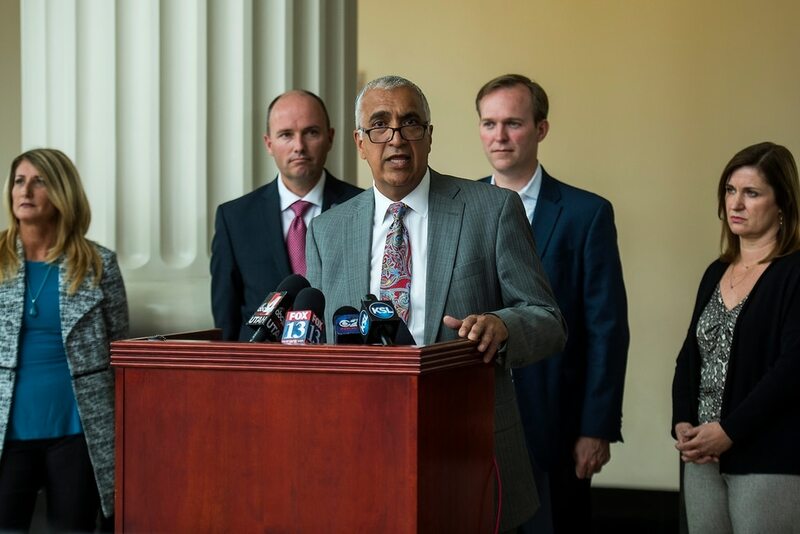 (Chris Detrick | The Salt Lake Tribune) ​District​ ​Attorney​ ​Sim​ ​Gill​ speaks during a press conference at Matheson Courthouse Wednesday, September 13, 2017. 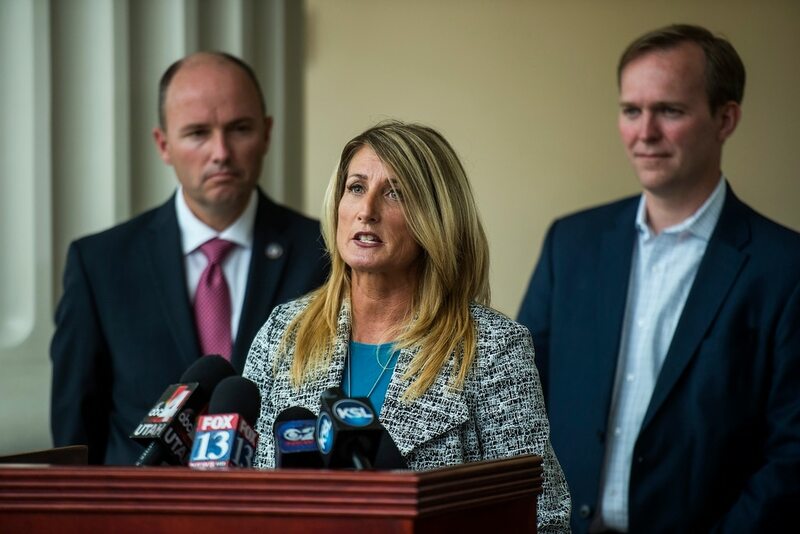 (Chris Detrick | The Salt Lake Tribune) ​Drug​ ​Court Peer​ ​Mentor​ ​Leighann​ ​Marsh speaks during a press conference at Matheson Courthouse Wednesday, September 13, 2017. (Chris Detrick | The Salt Lake Tribune) ​Lt.​ ​Gov.​ ​Spencer​ ​Cox speaks during a press conference at Matheson Courthouse Wednesday, September 13, 2017. (Chris Detrick | The Salt Lake Tribune) Salt Lake County ​Mayor​ ​Ben​ ​McAdams speaks during a press conference at Matheson Courthouse Wednesday, September 13, 2017. 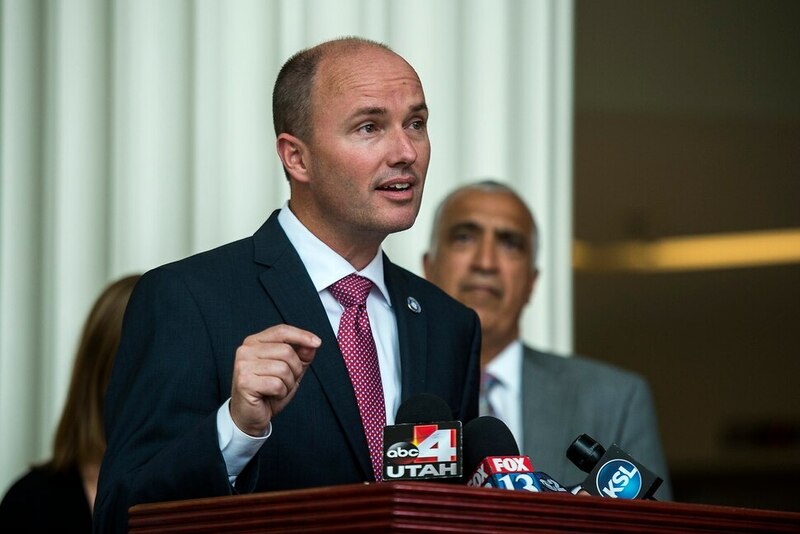 (Chris Detrick | The Salt Lake Tribune) ​Lt.​ ​Gov.​ ​Spencer​ ​Cox listens as Salt Lake County ​Mayor​ ​Ben​ ​McAdams speaks during a press conference at Matheson Courthouse Wednesday, September 13, 2017. One month and more than 1,000 arrests later, state and local officials on Wednesday announced the latest step in Operation Rio Grande: a new drug court for those rounded up in the crackdown who want treatment. Thirty-five people went before a 3rd District judge on Wednesday on the first day of the program, created to help handle the influx of defendants arrested in the past month. The court, though, is not run like a typical courtroom in the Matheson courthouse. It’s less rigid, more celebratory. There’s clapping every time someone says how long they’ve been clean. Thirty days, one woman announces Wednesday. Another man said he’s been clean since his arrest 31 days earlier. Twenty-one days for another woman. And 3rd District Judge Dennis Fuchs makes friendly banter with each one: What do they do for work? What’s their drug of choice? Why do they think they relapsed? Why is this time going to be different? Many of those who came to court Wednesday told the judge they were homeless before their arrest and bought drugs “on the block” near Rio Grande Street. Most expressed excitement to begin treatment, asking the judge when they might get a bed at a treatment center. He didn’t know, Fuchs told them. But hopefully soon. The defendants will come back weekly and will eventually plead guilty to charges to continue in the program. But the pleas will be held in abeyance, meaning the cases will be dismissed if they go through treatment and follow court rules. Participants should focus on three things now, Fuchs told each one as they shuffled to the podium, their hands and feet shackled: Stay in treatment. Come to court. Do your urine drug tests. Officials say the new court will accommodate up to 125 participants. So far, 60 jail inmates have been identified as potential candidates through a screening process that involved public defenders, prosecutors and social workers. All will have access to one of the 37 treatment beds that county officials have worked to open in the past month, according to officials. Salt Lake County Mayor Ben McAdams called the implementation of the drug treatment program “another important milestone” to reduce lawlessness and rampant drug dealing near Salt Lake City’s downtown homeless shelter. It’s the fourth drug court program now underway in the 3rd District Court, and Utah State Court Administrator Rick Schwermer said the new court is no different than the others. The exception, he said, is that all the participants are beginning on the same day. And the new court is not exclusively for those arrested in Operation Rio Grande, said Lt. Gov. Spencer Cox, though he said many of the available beds will go to those people. Cox said Wednesday that adding the drug court helps achieve one of the most important goals of Operation Rio Grande: getting treatment for those who need it and helping them succeed. Just before the Wednesday news conference, Cox said he said been in the Rio Grande area and talking to people about the changes.